Wonderful, powerful words. It's crazy to think that over 50 years later the same issues are STILL issues. "You deplore the demonstrations taking place in Birmingham. But your statement, I am sorry to say, fails so express a similar concern for the conditions that brought about the demonstrations." <----Now THAT is a point to ponder! It amazes me that those in charge have to be told that. Amazes me and saddens me. I respect what this man did, not just for African-Americans, but for the world. January 18, 2015 Edited to add: Following the protests in the States right now in what many are calling the second Civil Rights movement reminds me that there's a lot more work to do. Calling protesters in Ferguson, MO and elsewhere thugs instead of investigating why people feel their only option is to protest is one of the many problems we're dealing with. 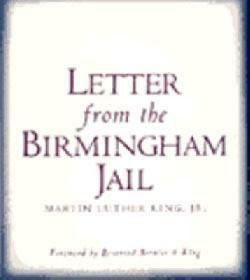 Sign into Goodreads to see if any of your friends have read Letter from the Birmingham Jail. I knew you would like it, I will review it myself in due course. I have it as apart of The Autobiography of Martin Luther King, Jr.. Thanks Ken:) Can't wait to read your review. I'm making my way through his autobiography right now, great stuff. Thanks for the link. It's been so long since I read his bio and I remembered this letter contained without. It was good to re-read it just now. Karl wrote: "Thanks for the link. It's been so long since I read his bio and I remembered this letter contained without. It was good to re-read it just now." You're welcome:) I'm actually reading his bio right now for the first time and just noticed that letter is in there, silly me! Well, it's worth being packaged all by itself. Okay sure, some of the language is flowery but it gets the message across. Haha! That's a good one :D Have you read the Malcolm X bio yet? Your review and the included link (thanks!) led me to read the letter in full. I have a reputation for writing powerful, effective letters, and I am proud to say that I have successfully fought for the rights of many individuals against the bigger society who have attempted to repress them. However, this letter is many leagues above any letter that I have ever written! It is inspiring. Is there public record of the response from the eight clergymen to whom this open letter was addressed? I assume that your reading and review of the letter on Martin Luther King Jr Day is a deliberate coincidence. I will now go ahead and write my own review. Rowena wrote: "Haha! That's a good one :D Have you read the Malcolm X bio yet?" Yeah, but again, been so long and if I am a lazy reviewer now, I was even worse before goodreads. I will 100% revisit Malcolm X.
Lance Greenfield wrote: "Your review and the included link (thanks!) led me to read the letter in full. I have a reputation for writing powerful, effective letters, and I am proud to say that I have successfully fought fo..."
You're welcome, Lance! Glad you were able to read it. I agree, that is probably one of the best letters I have ever read in my life. How he managed to stay so noble during that time is beyond me. Had it been me, I would not have been that calm!I'm not sure if the clergymen responded, I will do some investigating now. And yes, I tend to do nerdy things like themed reading whenever I can:) It's my way of commemorating. Karl wrote: "Rowena wrote: "Haha! That's a good one :D Have you read the Malcolm X bio yet?" Yeah, but again, been so long and if I am a lazy reviewer now, I was even worse before goodreads. I will 100% revisi..."
I never really started writing reviews until people kept asking me to write them. Writing reviews reminded me too much of being forced to do so in school! I still haven't read Malcolm X's bio. I remember watching the movie when I was 10 but , of course, it had too little impact on me. I watched an awesome documentary on the Nation of Islam which compelled me to learn more about Malcolm X.
Rowena wrote: "I never really started writing reviews until people kept asking me to write them. Writing reviews reminded me too much of being forced to do so in school! I started writing reviews when the BBC were running a RAW (Read and Write) campaign in UK and offered a free quick read book (c.100 pages) in return for a review that could be read out by a presenter in one minute. And I hated writing reviews at school too. It was too formulaic. Now I can write my reviews with freedom and passion, even though that sometimes leads me into trouble, as you know Rowena! Writing reviews is a tricky thing. I only started getting into the habit of it when my reading habits improved and I felt I was confident enough to. I had trouble doing this in school naturally because you don't want to write about something you didn't choose to read, but now of course thanks to Goodreads I have little problem at espousing on a piece of literature. That's a good point Ken. The books were chosen for us at school, so there was a natural resentment before we even opened the front cover! Now I get a healthy diversity by being encouraged to step outside my comfort zone genres by my very good circle of GR friends. It's great fun! Haha! Yes, your controversial review ;) I wonder if I'll ever write any? Lance Greenfield wrote: "That's a good point Ken. The books were chosen for us at school, so there was a natural resentment before we even opened the front cover! Now I get a healthy diversity by being encouraged to step ..."
I detested Dickens because I was forced to read him for my GCSE's. Poor guy never stood a chance afterwards! Thanks for the link Rowena - I have the audio but it is good to have the text too. Leslie wrote: "Thanks for the link Rowena - I have the audio but it is good to have the text too." "Calling protesters in Ferguson, MO and elsewhere thugs instead of investigating why people feel their only option is to protest is one of the many problems we're dealing with. Amen to that, Rowena. And thanks for the timely link. Happy Mr.King Day! Dolors wrote: ""Calling protesters in Ferguson, MO and elsewhere thugs instead of investigating why people feel their only option is to protest is one of the many problems we're dealing with. Amen to that, Rowena..."
Leslie wrote: "Dolors wrote: ""Calling protesters in Ferguson, MO and elsewhere thugs instead of investigating why people feel their only option is to protest is one of the many problems we're dealing with. Amen ..."
Thanks for the link! It saddens me that we don't seem able to learn from our history. Inaniel wrote: "Thanks for the link! It saddens me that we don't seem able to learn from our history." You're welcome!And you're right. In the past week I've actually met a couple of girls who had never heard of Dr. King! Are they showing the movie Selma in Germany? Thank you very much for the link (and your review)! Kathy wrote: "Thank you very much for the link (and your review)!" Amanda wrote: "I really like you, Rowena"